In England his brother, Verne, noted the events of his day in the diary he was keeping . . . Weather is very bad today. Snow flurries and plenty of ice on everything. Cleaned ice off of plane 5651 and went up on a practice mission. Scrubbed mission, but we didn’t know. Flew around 1½ hours. Sure is cold. Goldberg’s heated suit went out and we had a hell of a time.2 Received three letters and some cards today. Won ten shillings at poker. 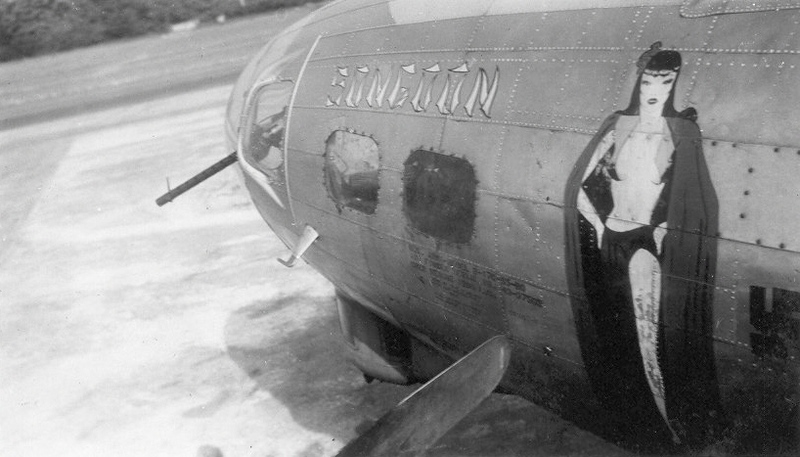 1 Plane 565: B-17G,Songoon, aircraft serial number 43-37565, was delivered to the USAAF at Cheyenne, Wyoming on April 29, 1944. A month later, May 26, 1944, it was assigned to the he 571st Bombardment Squadron, 390th Bombardment Group, Station 153. at Framlingham. “Eighth Air Force Operations History, 390th Bombardment Group (H)”, Eighth Air Force Historical Society. (http://www.8thafhs.com/get_one_acgroup.php?acgroup_id=13 : accessed 1 January 2015) Also see “Songoon” Framlingham. 571st Squadron Page (http://www.framlingham.co.uk/571st%20pictures/%27Songoon%27%20390th%20BG%20571st%20Sq,%2086%20missions.jpg : accessed 1 January 2015). 2 Sgt. Alvin Goldberg of Brooklyn, New York, the Radio Operator of Combat Crew #87. To keep warm at altitude where temperatures could be 30, 40, 50° below 0°, aircrew wore electrically-heated flying suits. This entry was posted in Uncategorized and tagged 43-37565, Alvin Goldberg, Cheyenne, Poker, Songoon. Bookmark the permalink. What’s going on with Wayne? He’s been silent for a while now. He’s either flying a lot of missions or too depressed to write in his journal, perhaps both.